This article was written to be published on December 28, 2009, in the Shenzhen Daily. However, it was "held back" (not published) because it was too much like a "general road map," without enough details. But I'll publish it here, and link it to more detailed articles later. I have visited the young emperor's tomb and the Tianhou Temple as recently as 2013; they were substantially as listed here. I haven't seen the gun, though, in quite some time. Spend a day in Chiwan! See an imperial tomb, a temple dedicated to a sea goddess, and a gun emplacement. Take bus 226 to Chiwan; it passes through Shekou Seaworld. Get off past a small traffic circle at Nanshan Gongsi (南山公司). Walk back straight through the traffic circle to a "tee" intersection; turn left. Walk about 5-10 minutes, past a school. Turn left and left again to Songshao Dimu, the tomb of the last Song emperor of China. See the statue of Lu Xiufu with the boy emperor Zhao Bing on his back. With the Song forces about to be defeated in a naval battle, Lu leapt into the sea, ending his and the boy's life, as well as the Song dynasty's struggle against the Yuan, who thus became rulers of China. Beyond the statue is the tomb itself, with offerings from those seeking the boy's help. Return to the bus stop and either take the bus back one stop (to Tianhou Gong 天后宫), or walk another 5-10 minutes, to the Tianhou Palace. This is a temple dedicated to Tianhou (also called Mazu, after whom Macao was named), the Chinese goddess of sailors and fishermen. Admission to the temple is 15rmb. Observe the towers, statues, incense pavilion, and Wishing Tree. Don't miss the museums in the buildings around the outer courtyard. Leaving the temple, you may walk about 20-30 minutes back along the bus route (turning right on Zuopaotai Road), or take the bus three stops back to Zuo Paotai (左炮台), or "Left Fort." Walk up the road to the right, then climb the stairs, until you reach the "fort," a former gun emplacement first built in the 17th century. 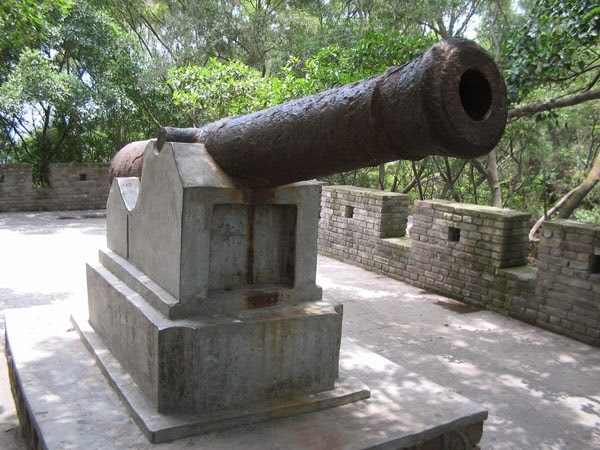 See one of the original guns, remains of a barracks building, and a modern statue of 19th-century Lin Zexu, hero in the "Opium Wars" between China and the British Empire. Return to the bus stop and take bus 226 back to Shekou and beyond. 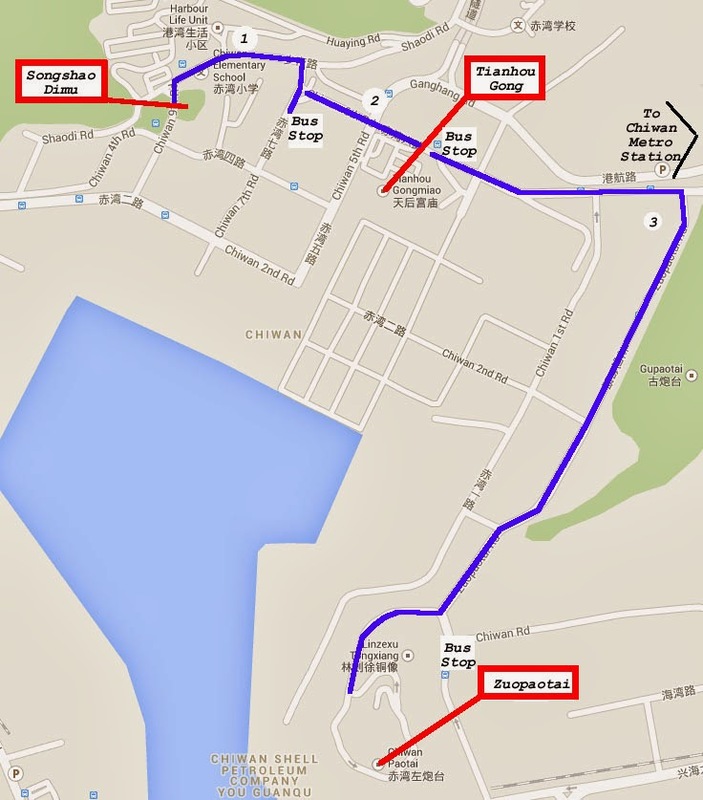 Note that you can now take the Shekou Metro Line to its end at Chiwan. The map above (or the online version below) may help. Here are the pictures I submitted to the newspaper. There will be more in other articles, which will be linked here.